Even though we've all pretty much seen the Jeep Gladiator, it's still exciting to finally see the officially unveiled pickup truck. And it does indeed look like a simple Wrangler pickup. It has fully removable soft and hard tops, doors and a folding windshield. The doors are the same as the Wrangler Unlimited's. It has round headlights, chunky fender flares and nearly the same interior. But it's more than that, blending much of the beloved SUV with some unique features for the pickup truck. 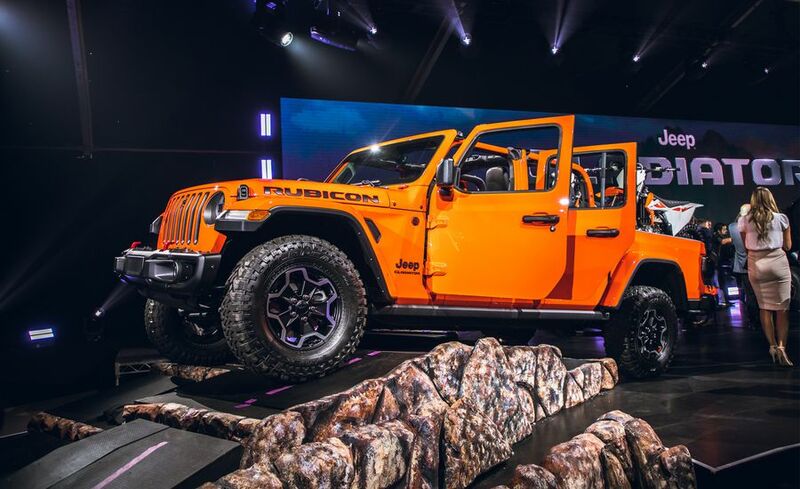 For starters, the Gladiator features a new frame not shared with Wrangler that's a whopping 31 inches longer than the one under the Wrangler Unlimited. The wheelbase of the Gladiator is also 19.4 inches longer than a Wrangler Unlimited. The Gladiator continues to use solid front and rear axles, both of which are Dana 44s in two available track widths, but the rear five-link coil suspension is a unique design developed for better ride quality. Propelling this chassis initially will be the 3.6-liter gasoline V6 from the Wrangler with either a six-speed manual or eight-speed automatic transmission. It makes 285 horsepower and 260 pound-feet of torque. In 2020, Jeep will start offering a 3.0-liter turbodiesel V6 that is a thoroughly redesigned version of the engine found in the outgoing Ram EcoDiesel. It's down in power compared to the gas engine at 260 horses, but it more than makes up for it with 442 pound-feet of torque. The only other diesel in this small to midsize truck segment is the Colorado and Canyon diesel trucks. Their diesel four-cylinder engines only make 181 horsepower and 369 pound-feet of torque. All Gladiators with either engine send their power through a selectable part-time four-wheel drive system. Fuel economy for either engine option has yet to be announced. On the subject of capability, the Gladiator has some impressive towing and payload numbers. Maximum towing capacity is 7,650 pounds. That's 150 pounds more than the next best gas-powered truck in this segment, the Ford Ranger. 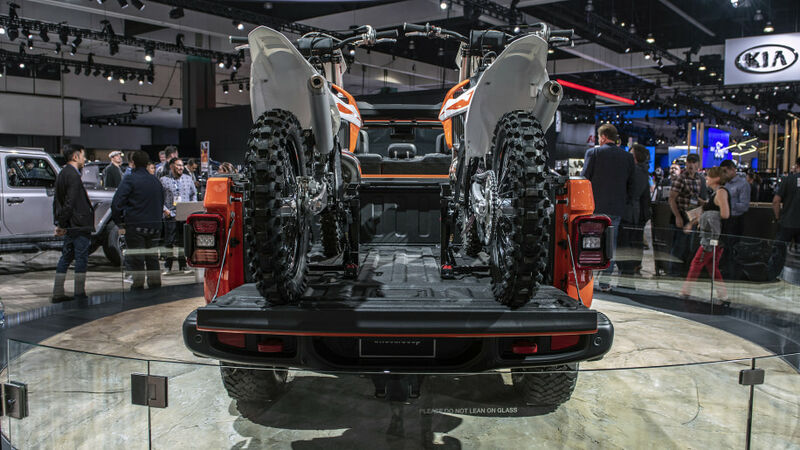 Maximum payload capacity is 1,600 pounds, which isn't the highest in the segment, but falls right in the range of the Ford Ranger and Chevy Colorado gas models. The bed is 5 feet long and is made of steel with an aluminum tailgate. It has various tie-down points and power outlets. Regarding the towing and payload numbers, it should be noted that the top towing capacity is only available on a Sport trim with the 3.6-liter V6, eight-speed automatic and 4.10 final drive ratio. For the maximum payload, you need a Sport trim Gladiator with 3.6-liter engine, six-speed manual and 3.73 final drive ratio. Though the Sport trims have the most potential for carrying stuff, they're not the only ones available. Sport and Sport S round out the bottom of the range followed by the more luxury-oriented Overland trim, which fills the space of the Wrangler's Sahara trim. This trim adds body-color fender flares and LED headlights, along with some extra standard equipment. At the top of the range is the Rubicon, which like its Wrangler counterpart, adds loads of off-road equipment. Among the features are shorter gearing, standard wider axles, electronic locking front and rear differentials, electronic anti-roll bar disconnect, Fox monotube shocks, 33-inch tires, a front-mounted trail camera for seeing over hills, and raised fender flares in case you want to upgrade to 35-inch tires. The Rubicon adds an off-road rear bumper and steel rocker guards that run between the wheels and along the bed's overhang. This will be handy since we've seen how the bed can drag off-road. As we touched on earlier in this article, most of the rest of the Gladiator is like the Wrangler. Most of the cab is similar to a Wrangler Unlimited, and the doors are exactly the same. The sport bar, of course, ends right at the back of the rear seats to make space for the bed, and new tops have been created for it, but they have all the functionality of Wrangler tops. The soft roof is standard and can have just the rear window section removed, or everything folded up. The front half can lift open, too. The hard top available is still split into three sections, two T-top-style panels up front and a large back half. Most of the truck's design is similar to the Wrangler, but the grille has been redesigned with larger openings for better cooling when hauling heavy loads. Inside, the rear seats now feature locking storage underneath. There's an optional Bluetooth wireless speaker that can be stored in the back where it stays charged for use anytime and anywhere. Infotainment starts with a standard 5-inch touchscreen, and 7.4- and 8-inch systems are available that include Apple CarPlay and Android Auto. The Gladiator will go on sale in the second quarter of 2019. Pricing hasn't been announced yet, but we expect base prices will be higher than equivalent Wranglers. More details including fuel economy will likely come in the next few months leading up to the on-sale date. 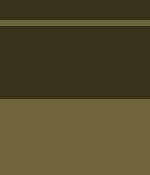 Last edited by Jimmyb; 29-11-2018 at 05:18 PM. THE ALL-NEW JEEP GLADIATOR! - Thoughts?